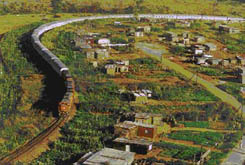 For most people, a train going through the neighbourhood is a nuisance. For millions of South Africans, it's salvation. Sheraton Centre Hotel in Toronto. and their account of this very unique project in South Africa. 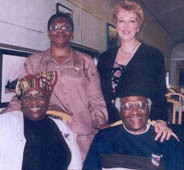 Nobel Laureate Archbishop Desmond Tutu and his wife, Mrs Leah Tutu, were in Toronto on a fund raising tour. South African Women for Women, as an organization with a strong mandate of supporting outstanding South African women, are pleased to have incorporated Mrs. Tutu's visit into our celebrations and help raise money for the Phelophepa Train project. Dedication and concern for others is very much a part of the life of Mrs Tutu and the Archbishop. He continues to dedicate his life to humanitarian concerns, not only in South Africa, but around the world. Mrs. Tutu continues to champion many causes while at the same time assisting her husband in his work, supporting him and standing beside him as they fought apartheid, poverty and ignorance. Among their many worthwhile causes is the Phelophepa Health Care Train. One of the projects SAWW has worked on very hard this year is our Health Promotional Initiative. As part of this initiative, we are supportive of Mrs. Tutu's efforts in improving health care through her patronage of the Phelophepa Health Care Train. This gala event was presented under the auspices of The Canadian Friends of the Phelophepa Health Care Train, and under the distinguished patronage of the South African High Commissioner to Canada, His Excellency André Jaquet. Mr. Trevor Wilson, President of T.W.I. Inc., served as the Dinner Chairman and Mrs. Mary-Anne Chambers, Senior Vice President, Electronic Banking, Scotiabank, graciously agreed to serve as the Deputy Chair. The event was produced by Adriaans & Associates AND T.W.I. INC. in conjunction with Literature for Life, a community-based organization dedicated to promoting literacy and education for young unwed mothers.